Duration: 9 – 10 hours approx. Our tour begins at the Amador Causeway, with two starting points depending on the operation of the tour that day. The first point is the Flamenco Marina (behind Alberto´s Restaurant) and the second point La Playita de Amador, both very close to each other. At the time of your reservation will be confirmed which will be the starting point of your tour. When we have partial and complete transit together check-in will be at 7.00am. When we only have partial transit check-in is at 9am. With your reservation we will give you the exact time of departure of your tour. Example of how it might be the partial transit tour. This operation may vary, sailing away from the Amador Causeway or boarding a bus that will transport you to Gamboa where you board the cruise and begin the tour. It all depends on the scheduled dates. Our trip departs from the Amador Causeway at 7:30 a.m., and you will travel from the Pacific Ocean to the Atlantic Ocean on the same day. Once in the Pacific Ocean, you will be able to admire the Bay of Panama and Panama City’s splendorous skyline before passing under the Bridge of the Americas. The vessel will then transit through the first set of locks, the Miraflores Locks, where it will ascend 18 meters in two distinct steps. Next, the cruise will enter Miraflores Lake, which is a small artificial body of fresh water that separates Pedro Miguel Locks from Miraflores Locks. The vessel will transit through Pedro Miguel Locks, which is one of the two sets of locks on the Pacific side, and here the vessel ascends 9 meters in one step. After exiting Pedro Miguel locks, the cruise will travel through the Gaillard Cut, where the Chagres River flows into the canal. The Gaillard Cut (also known as Culebra Cut because its curves resemble a snake) is one of the main points of interest for visitors because it was carved through the Continental Divide and this section of the Canal is full of history and geological value. As you transit the Cut you will be able to appreciate the continuous maintenance that this area requires, because it is very susceptible to landslides. In this area you will also be able to observe the work in process for the Panama Canal expansion project. You will enjoy a trip through Gatun Lake, which was formed by erecting the Gatun Dam across the Chagres River. During your transit through Gatun Lake you will pass the Smithsonian Research Station at Barro Colorado. 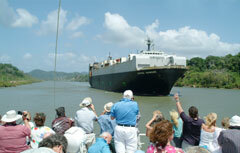 You will also experience the Gatun Locks, which are the only set of locks in the Atlantic sector. In Gatun Locks, the vessel will be lowered a total of 26 meters in three distinct chambers. Upon arriving at Colon, you will disembark at Pier 6, where transportation back to Panama City will be provided. Transportation by bus from Colon to Panama City. Price: Adults $250 USD. Children (under 8) $150. What to bring: Comfortable clothes and shoes, hat, sun block, sunglasses, camera, umbrella or raincoat and money for souvenirs. I am planning a trip to Panama soon. I would like to know the dates of your full day Panama Canal Cruise some time between 7/07/16 to 17/07/16. When will I get a reply. Do you have a Panama Day Tour any day of Dec. 5, 6, or 7, 2018? We have a 6 day tour starting Nov. 27th. We will be in a retreat at Amatierra Retreat and Wellness Center from Dec. 8 – 13. Please share the cost. Thank you for your response.